Add this issue to your photographic library for techniques on drive modes on your EOS camera, high ISO adding colour to your flash with filters, panoramas, reversing your lens for macro techniques and focusing screens. 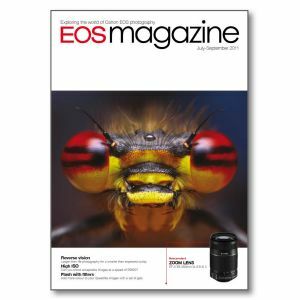 World of EOS News and reports from the world of Canon imaging. Q&A A selection of your photographic queries. Drive modes Are you a 'one press – one picture' person, or do you like to rattle off a whole sequence of images in one go? Focus points Landscape photographers take note – the autofocus system of your camera might not be giving you optimum results. High ISO Now you can shoot in very low light without the need for flash. But does high ISO lead to low quality photographs? Flash with filters Is a basic flashgun enough? We show you how to take control of your Speedlite by adding colour with filters. Sweet spot Andrew Gibson shows you how to test your lens to find the aperture which gives optimum performance. Reverse vision Attaching your lens in reverse is all it takes to enter a world where tiny creatures barely visible to the eye fill the frame. How was it shot? Lightstream images as a signature shot for one Canon photographer. Panoramas Create sweeping panoramic images by shooting a number of images and merging them using computer software. Screen change We explain how a different focusing screen can help with some types of photography and with manual focusing.